The protracted dispute involved Mandate Trade Union members at Marks & Spencers and had led to a strike last year. 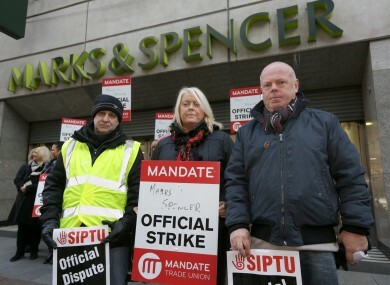 File: Derek Chervi, Helen Carey and Pat Hayden, at the Marks and Spencer's store on Mary Street in Dublin strike last December. A PROTRACTED DISPUTE by Mandate Trade Union members in Marks & Spencer has come to an end after they voted overwhelmingly in favour of a new set of proposals. The union said that the workers voted by a margin of 82% in favour of the proposals. It describes the proposals as a significant improvement on the original proposals put forward by the company last year. Mandate Assistant General Secretary Gerry Light said that the agreement improves the situation for the union’s members in terms of the original set of proposals, and “is also an improvement on the Labour Court recommendation issued in March of this year”. The dispute between Marks & Spencer workers and their employer was over the company seeking cost cutting measures. The union felt that proposals put forward by the company “would have resulted in a very detrimental effect on the living standards of all [its] workers”. Mandate members rejected the original proposals, which led to a one-day national strike last December. They also rejected the Labour Court Recommendation issued in March of this year. Light said the workers “were put in a very difficult position but through their unity they have managed to secure a much more satisfactory offer”. He called for the restoration of a better industrial relations environment at the retail company. Email “No more strikes: M&S dispute ends as staff accept proposals”. Feedback on “No more strikes: M&S dispute ends as staff accept proposals”.